Cuban style chicken stew cooked with bell peppers and onions in tomato sauce along with a touch of chardonnay wine and capers. 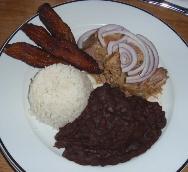 Popular Cuban dish. Shredded beef cooked with bell peppers and onions in a tomato sauce.